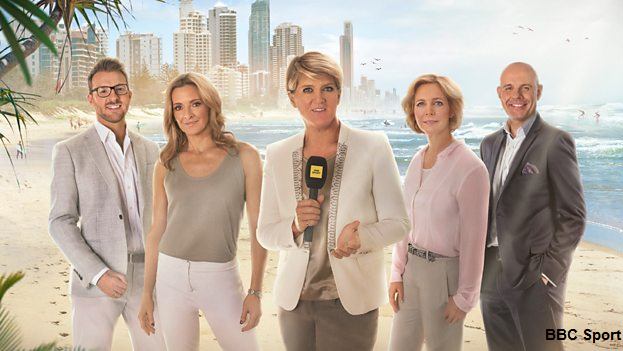 The BBC has revealed details of its 2018 Commonwealth Games coverage, taking place in April, live from Australia's Gold Coast. BBC Sport stalwarts Clare Balding, Hazel Irvine, Gabby Logan, Jason Mohammad and JJ Chalmers will front live TV coverage, with Steve Parry and Allison Curbishley leading BBC Radio 5 Live coverage, which starts on Wednesday 4th April and runs until Sunday 15th April (Australian time). In total, there will be 200 hours of coverage across BBC One, BBC Two, BBC Red Button, BBC Sport website, iPlayer and radio, but less than four years ago, when Glasgow hosted the Commonwealth Games. Notably, viewers will not see the same range of extra Red Button channels as last time. Clare Balding, Gabby Logan and Jason Mohammad will present coverage live from BBC Sport HQ in Salford with Hazel Irvine and JJ Chalmers live in Queensland. TV coverage: when and where? Viewers will be able to watch live and recorded coverage between midnight until 8pm across BBC One and BBC Two for the 11-day duration of the Commonwealth Games, featuring a regular evening highlights show at 6.30pm on BBC Two. BBC Four will then show a further hour of Games action from 8pm. The BBC Red Button service will provide viewers a 24/7 schedule of live and catch-up programming throughout the Games. Radio coverage: when and where? Radio coverage of the Commonwealth Games will be broadcast on BBC Radio 5 live. The 5 live Breakfast programme will be the first to bring listeners overnight key activity from the Gold Coast, followed by live commentary of the best of the day’s action across the daytime schedules. BBC Sport online will live stream all the key moments of the Commonwealth Games to desktops, tablets, mobiles and connected TVs, with audiences also able to watch live on BBC iPlayer or via the Red Button+ service. BBC Sport online will also offer on-demand video clips, live reporting and analysis so that audiences can catch up with the Games at any time by visiting the website or downloading the BBC Sport app where they can personalise the offering.